The Richard Caton Woodville prints and pictures below represent a small selection of the many works available. If there is anything by Richard Caton Woodville that you’re looking for then please contact us on 07889 800857. Richard Caton Woodville Military and War Artist was born in 1856 and was an English artist and illustrator, who is best known for being one of the most prolific and effective painters of battle scenes in the late 19th and early 20th centuries. Richard Caton Woodville first experienced battle first-hand when he was sent by the Illustrated London News to report upon the Russo-Turkish War (1877-1878), and then again in the 1882 Anglo-Egyptian War, where he made numerous sketches in December 1882, and also obtained photographs of the trenches at Tel-e-Kebir for his friend and co-artist Alphonse-Marie-Adolphe de Neuville, who had been commissioned to paint a scene of the battle. In 1879, Woodville’s Before Leuthen, 3 Dec 1757 was exhibited in the Royal Academy. It proved popular, and afterwards he began to regularly be exhibited in Burlington House, where 21 of his battle paintings were eventually shown. His most popular works there were ones that dealt with contemporary wars, such as the Second Anglo-Afghan War, Candahar [sic], and Maiwand: Saving the Guns, (Walker Art Gallery), the Zulu War, and the First Boer War. His works from Egypt were exhibited at the Fine Art Society in 1883, where his painting The Moonlight Charge at Kassassin proved very popular. The following year he exhibited by Royal Command another painting he had done of the war in Egypt, entitled The Guards at Tel-e-Kebir (Royal Collection). He continued to paint scenes of battle, and few battles or wars that Great Britain fought during his life were not touched upon by him, including the Second Boer War, and World War I. 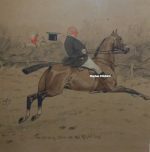 Despite his precocious talent for capturing the dramatic moments of contemporary battles, Woodville also enjoyed recreating historical scenes in both oil and watercolour. The Illustrated London News commissioned him to complete a commemorative special series recreating the most famous British battles of history. 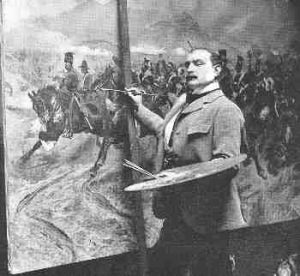 He depicted The Charge of the Light Brigade (Palacio Real de Madrid) and The Charge of the 21st Lancers at Omdurman (Walker Art Gallery), Battle of Blenheim, Battle of Badajos and several Battle of Waterloo pictures. During World War I, Woodville was compelled to return to the depiction of current events, and three of his Great War works were displayed in the Royal Academy. These were The 2nd Batt. Manchester Regiment taking six guns at dawn near St. Quentin, Entry of the 5th Lancers into Mons, and Halloween, 1914: Stand of the London Scottish on Messines Ridge (London Scottish Regiment Museum Trust) exhibited in the year of his death, 1927. During his lifetime, Woodville enjoyed great popularity and was probably considered the best artist of his genre. He wrote as well as painted, and was often the subject of magazine and journal articles. 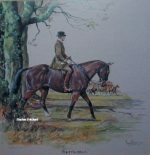 He had a deep passion for the British Army and had even joined the Berkshire Yeomanry in 1879, staying with them until 1914 when he joined the National Reserve as a Captain. On 17 August 1927, Woodville was found shot at his studio at St John’s Wood; a revolver was also found. An inquest determined that he was of unsound mind when he committed suicide. Richard Caton Woodville is still exhibited in the National Army Museum, the Tate, Walker Art Gallery, and the Royal Academy.